For more than thirty five years, the National Neighborhood Watch Program has been one of the most effective ways for citizens to help law enforcement with the protection of our neighborhoods. This community-based crime prevention program is a simple and direct approach toward protecting our community from criminal attacks. The program involves the reduction of criminal opportunity through citizen participation in crime prevention measures, such as being alert and aware, reporting suspicious and criminal activity to the police, and initiating actions that reduce criminal opportunity. Members are NOT asked to put themselves in danger or to apprehend criminals, just "be on the look out." Neighborhood Watch groups offer many benefits to the community, such as crime reduction and a better quality of life. Community members may feel a stronger sense of security, responsibility, and personal control through the participation in Neighborhood Watch groups. Neighborhood Watch groups also help build community pride, unity, and prepare us for helping ourselves and others in the community. 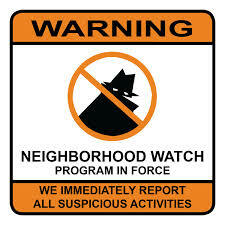 Residents of the Balmorea Subdivision, please contact your Watch Leader, Brian, to join your neighborhood watch group. Residents of the Blackberry Crossing West Subdivision, please contact your Watch Leader, Marcus Roberts, to join your neighborhood watch group. Residents of the Fairfield Way and Cambridge Foxmoor Subdivisions, please contact your Watch Leader, Stan Bond, to join your neighborhood watch group. Residents of the Huntington Chase Subdivision, please contact your Watch Leader, Alan Lay, to join your neighborhood watch group. Residents of the Lakewood Creek West Subdivision, please contact your Watch Leaders, Mark Kunkle and Rick Helfrich, to join your neighborhood watch group. Residents of the Lakewood Creek Subdivision, please contact your Watch Leader, Pat Connor, to join your neighborhood watch group. Residents of the Montgomery Crossings Subdivision, please contact your Watch Leader, Michelle Ambroz, to join your neighborhood watch group.